Sam Wildow | Daily Call Scott Rodriguez (left) unrolls the custom rug that Design 52 owner and designer Mary Frances Rodriguez designed and had woven in Kathmandu, Nepal for the Hinds family (center) on Friday. 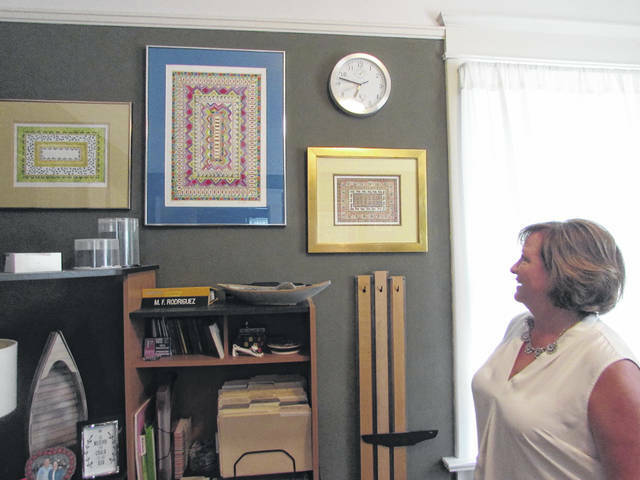 Sam Wildow | Daily Call Design52 Custom Rugs owner and designer Mary Frances Rodriguez discusses other rug designs she has created in her studio on Friday. 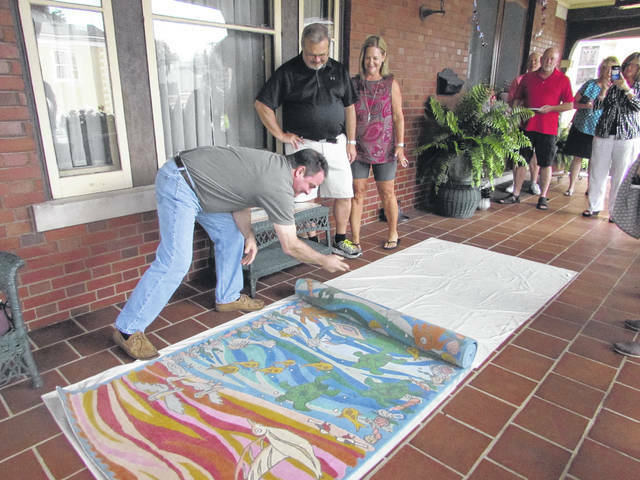 PIQUA — At an unveiling party on Friday, Design52 Custom Rugs owner and designer Mary Frances Rodriguez rolled out a new custom rug that took over seven months to complete. Rodriguez designed the original artwork that the rug was based on and created for Piqua’s Hinds family — Kazy, the city’s mayor, her husband, Joe, and their son, Paul. Rodriguez drew the original design by hand with pen and ink and colorized it with watercolor. “I’m so excited,” Kazy Hinds said prior to the unveiling. She added that so much of their family’s life story is connected within the symbols and themes in the artwork. The artwork was inspired by aquatic themes and artwork by Gulf Coast artist Walter Anderson, and it depicted a sea shore and sunset. The scene was a callback to the Hinds family’s past living in coastal regions, as Kazy grew up in south Florida and they also lived in North Carolina for a period of time. After Rodriguez designed the rug last year, she had a weaver in Kathmandu, Nepal weave the rug by hand. The material in the rug was handspun Himalayan wool yarn with 100 knots per square inch. “This is the sixth one he’s woven for me,” Rodriguez said. Rodriguez said that she works with a weaver in Nepal for designs of woven rugs and a weaver in India for designs that require a flat weave for geometric-shaped designs. Rodriguez became interested in designing rugs while pursuing a Bachelor of Arts degree and majoring in fine art at the University of Mobile, Alabama, where she learned about the role of rugs in Islamic culture. She designed three rugs for a presentation she had to do on the effect of Islamic culture on the art of rug design. “I was hooked,” Rodriguez said. Rodriguez began her business in 2007, when she had her first rug woven in Kathmandu, and she revamped her business last year. In the past, Rodriguez has also completed a custom rug for Hartzell Propeller which was 9 x 12 feet and featured the company’s various logos and different configurations of propellers. Upon rolling out the custom 43-inch x 10-foot rug for the Hinds family on Friday, they found a surprise that Kazy had requested be at the bottom of the rug, which read “Feels Like Home,” a phrase that Kazy and Joe have engraved on their wedding rings. “We knew from right then in 1999 that it just feels like home,” Joe said. The rug featured sea turtles on the beach, scallop shells to symbolize a journey, and two robins. “I’m blown away by the surprise,” Joe said, adding that the rug translates into nice memories for the family. In addition to her design experience, Rodriguez has over 30 years of experience in marketing, sales, event planning, and public relations. For more information about Design52 Custom Rugs, visit design52customrugs.com or contact Rodriguez at design52@woh.rr.com. https://www.dailycall.com/wp-content/uploads/sites/30/2018/06/web1_IMG_3795.jpgSam Wildow | Daily Call Scott Rodriguez (left) unrolls the custom rug that Design 52 owner and designer Mary Frances Rodriguez designed and had woven in Kathmandu, Nepal for the Hinds family (center) on Friday. https://www.dailycall.com/wp-content/uploads/sites/30/2018/06/web1_IMG_3818.jpgSam Wildow | Daily Call Design52 Custom Rugs owner and designer Mary Frances Rodriguez discusses other rug designs she has created in her studio on Friday.